This past Saturday, I walked over to the Charles River for the fiftieth annual Head of the Charles Regatta. I set my sight on the Reunion Village located at the race’s halfway point to meet up with some old Hamilton College friends. While sipping Sierra Nevadas, nibbling on sweet potato fries dipped in maple mayo and watching the rowers zip by, we reminisced about the good ole college days in upstate New York. Walking back to my Cambridgeport apartment, I had Hamilton in mind when brainstorming lunch ideas. Hamilton had quite creative dining options including an amazing vegetarian cafe, Opus. Opus’ rotating menu featured falafel pitas, black bean and sweet potato burritos, and insanely gooey and delicious chocolate chip cookies. 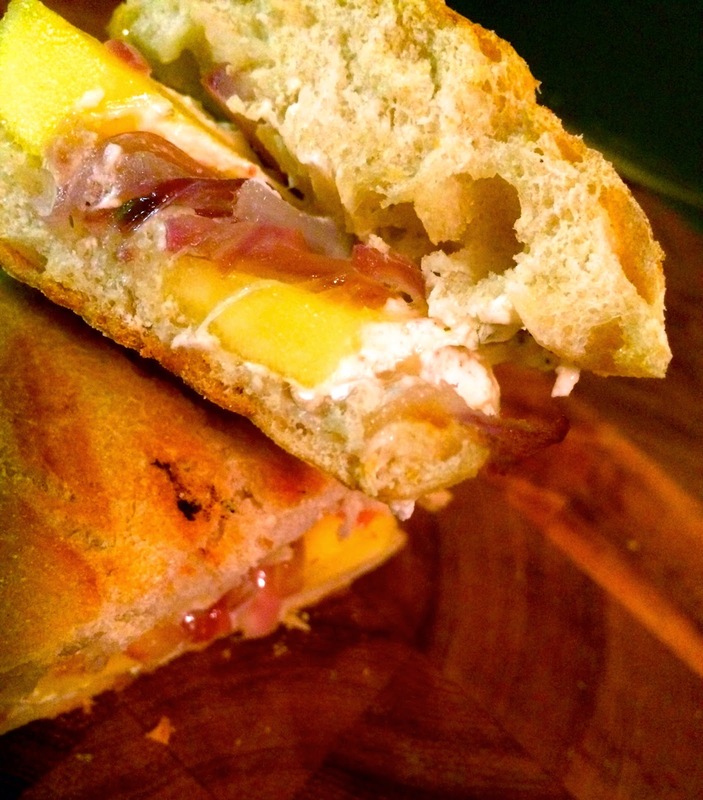 One rare item which, when on the menu, instantly generated a line of hungry students was the Mango Brie Panini. 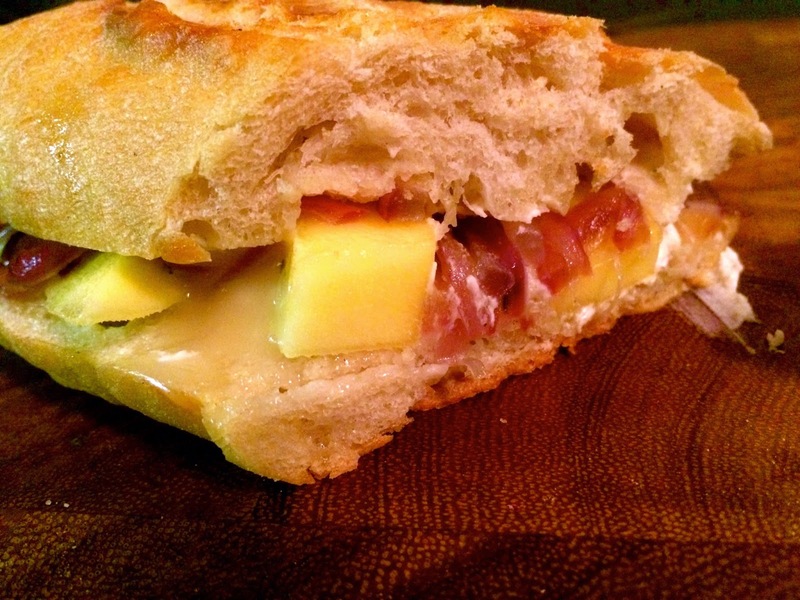 The unique pressed sandwich was the ultimate melty layering of sweet, salty and savory. Heat 1 T EVOO and 1 T butter in a large skillet over medium heat. Add the onions and sautee, stirring occasionally until soft and caramelized, about 17-20 minutes. Season with salt and pepper and set aside. Heat a panini press to medium-high heat. 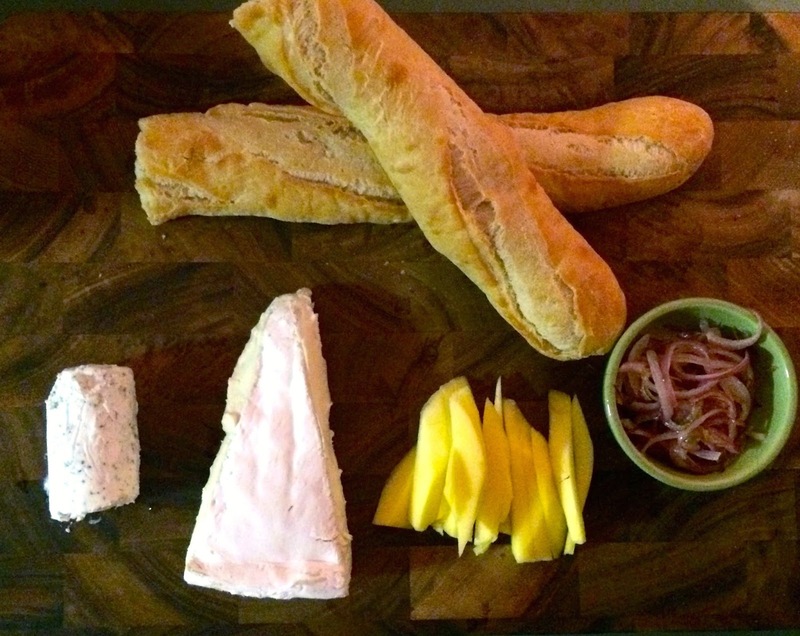 Drizzle EVOO on all sides of each baguette and arrange on a flat surface. On the 2 bottom halves, spread 2 oz of goat cheese. Evenly distribute the sliced mango atop the two pieces in a fan, then the sauteed onions, and then the sliced Brie. Top with a sprinkling of salt and pepper, then place the top two pieces of the baguette on top. Grill in the panini press for about 5-6 minutes until the interior is gooey and melted and exterior is golden and toasty. Slice each panini in half and enjoy. Makes 2 paninis. Maybe next time I'll make these mini-sized like Kara and float them atop a spicy soup!